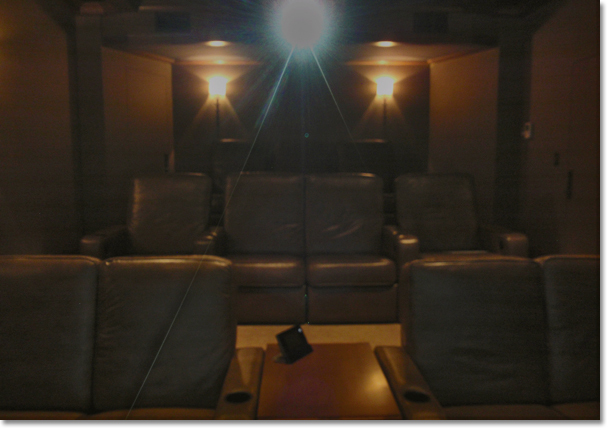 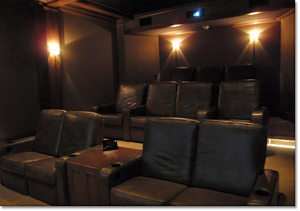 Cello designed and engineered this home theater literally from the exterior walls in. 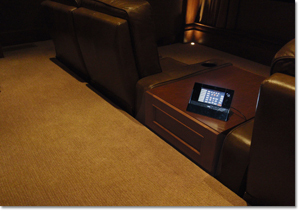 The floor for each row was built will D-Box platforms (a system that uses information encoded for each movie that makes the seats move to match the action on the screen) so that each set of seats could adjust how much motion affect they wanted. 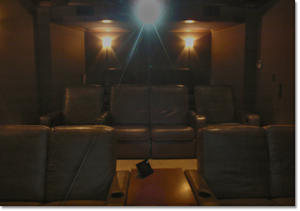 The projection system is housed in a hidden recess in the acoustic ceiling and uses a special wide angle lens to create a ‘constant height’ image, meaning that the image fills the screen vertically irrespective of the aspect ratio. 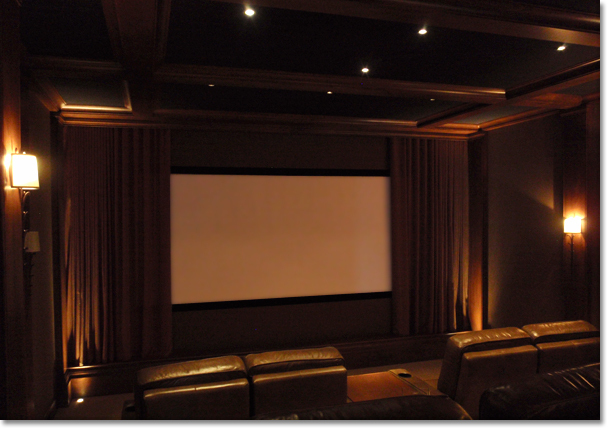 A custom motorized curtain is used to adjust the screen width for aspect ratios from 2.35:1 (Cinemascope) down to 1.33:1 (old style TV) and both the screen and curtain are acoustically transparent. 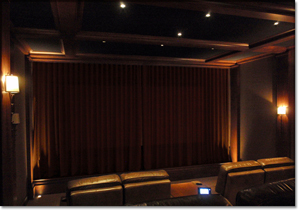 The sound system is completely custom designed to match the acoustic and aesthetic requirements of the room. 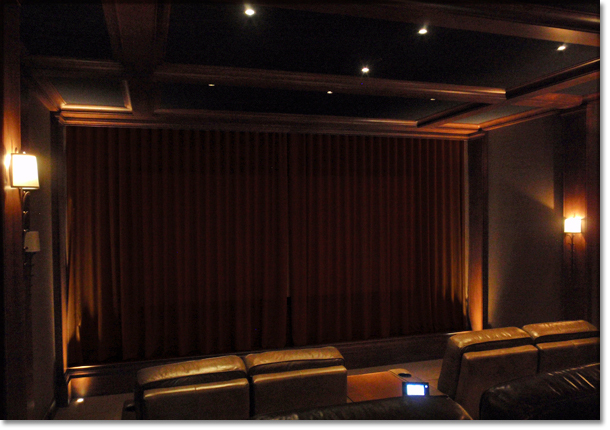 Behind the screen are Cello’s FU18 subwoofers and custom ATC SCM110 active speakers. 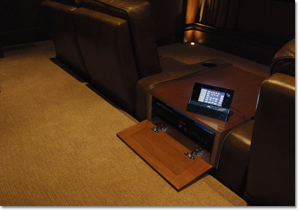 The six surround speakers are also custom active ATC’s. 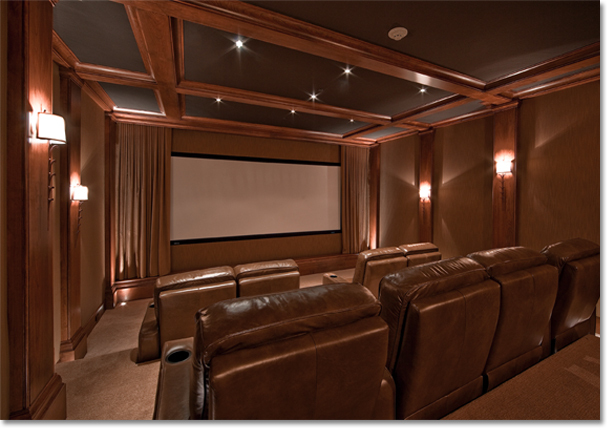 All amplifiers were remotely located into the control room below the theater to minimize noise and optimize cooling and wire run lengths. 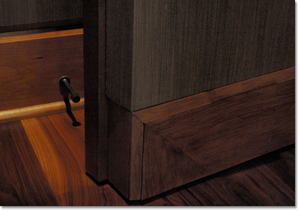 The combination of the room isolation (NR25), room acoustics, and the sound system quality allow for perfect fidelity, even at concert-level output (over 130dB at the seat, bass response flat down to 15Hz).